Prior to the Welcome Reception the attendees are guided through to the old Lecce city center starting from Castello Carlo V.
At the end of the tour a Welcome Aperitif will be served at Alex Restaurant. The attendees are transferred by Bus to Castro Marina. The beautiful Castro is imbued with history and legends. It is perched on a cliff, overlooking the Adriatic Sea, 48 km away from Lecce and, stretching towards the sea, it becomes a marina awarded the Blue Flag. This town boasts ancient origins, being the Roman heir of Castrum Minervae and, over the centuries, it has kept its importance, becoming one of the first counties in Salento. 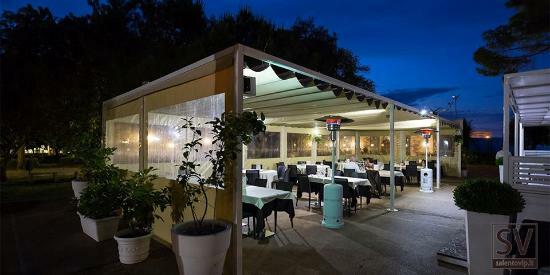 The dinner will be served at “Grotta del Conte Restaurant” in Castro Marina. Grotta del Conte is an ideal place where you can enjoy the fresh flavor of the sea by means of the traditional Salento’s cooking and typical dishes in a very nice, friendly and large hall inside, or on the terrace sitting in front of the charming landscape of Castro’s blue coast.